Discussion in 'Games In Development' started by sura_tc, Oct 27, 2017. This is just a minor constructive criticism, but even just changing the font would make this game look totally different. In the screencap you just posted, if it had a different font I wouldn't even know it was a rpgmaker game. Maybe something more scifi? Font licensing can be fairly expensive though. LOL gotta love the Unreal reference! Default font has been changed. Ritsuki (Kain’s wife) has her CG completely redone. She will look very different now. Basically, she will look better. Navy mission “Wcs negotiation” added. Ritsuki can also now join Kain on ground battles (once married). She is mediocre against organic beings but brilliant against machines. Custom status window background image has been added. Jayje and Marquise* like this. This patch focuses mainly on events with Kain’s wife, Ritsuki, revealing more about her and her (weird) habits. Personal mission “House hunt” added. Uranus outpost residential block expands further. An incident “Naked event” added. Not really a quest or any sort. Just a fan service event. Navy mission “Secure SOL-2685” added. An event “Station tax” added. Navy mission “Playing with fire” added. This game will be available on Steam (Free to play) as early access in late Feb. This has two major benefits. One is that this is a cheap way to copyright my game. Two is that the game will be updated automatically whenever I push an update. I found that the steam framework actually checks updated files, so you won’t download the whole package every time. Another minor benefit is you won’t need to worry about your save files unless your SSD/HDD kisses you farewell. I wish I could use Steam cloud save but I don't think that's available for MV. New title screen is added. Now, this one is going to be the final one. The title screen CG will remain the same but I will be adding more characters to it. Currently, it features Kain and Magenta only. 54 missions (quests) so far. About 16 hours of game content. Navy mission “The battle of Neptune” added. Side mission “Her last journey” added. Some small updates: Luna map complete. Cecil CG upgraded. Uranus residential block is now complete. Jaxx and Jessica (they are married) move in if you choose the correct choice in the game, etc. Marquise* and Jayje like this. You can see for yourself. The first one is the old model. The second one is the new model. I have not gotten very far, probably about 15 minutes getting lost, wondering where I can find a beer, any why most of the decks are unaccessable to me. I'm having troubles getting through the game.. Pretty much stuck at the floor where I arrived at the space station, or the floor with the recruiter. I actually left the recruiter before I was actually done with business, only to come back and realize I still have stuff to do with them. I got a message that the hero wants a beer, but I don't see a pub. Shouldn't every word of the United Solar System Federation be capitalized? Also how is the economy set up so monthly rent is twice the cost of leaving lunar gravity and moving to Jupiter? Beer is an optional item. It sold at a vending machine. As for being unable to access parts, Jupiter station is a navy station at heart. Kain wouldn't have much clearance. He will never. I found the beer vending machine! It was in a deck I forgot to check if I had gained access. I have goldfish memory at times, doesn't help I was two shots in at the time of playtest. I wandered into the battle simulation, and I'm in a very, very long fight with a Pirate that I lost? The battle simulation is a foreshadowing. The beginning of the game will be hard. You will need to grind though the game until you get into a cruiser. Navy mission “Chasing shadow” added. Navy mission “Private contract” added. Are skills implemented at this point? 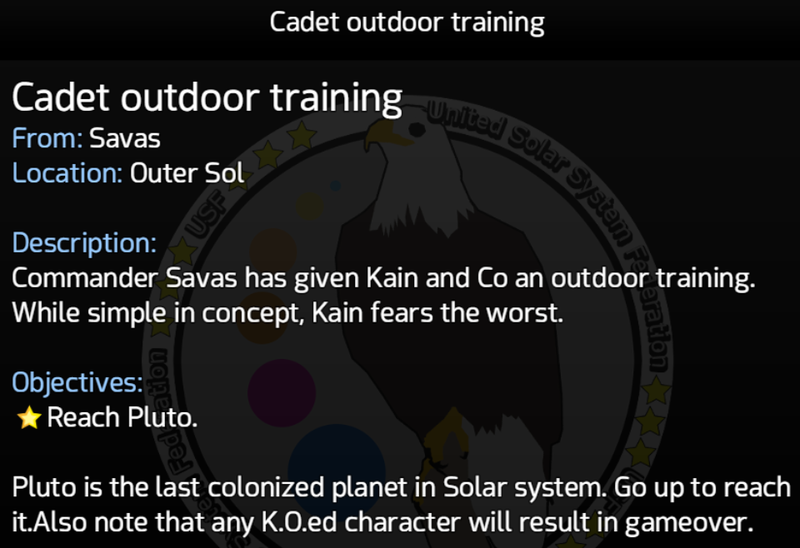 Kain and his fleet members can't equip a pistol or do anything in ground combat on the Pluto training mission. I got to the recommended level 4 for that mission but the Educate panel is still empty. Also, when leaving Pluto the other fleet ships stay at the default 1000 max HP, but Kain's ship goes to 100 max HP and gets one shot if a flee attempt isn't successful. Skills appear at level 5 for Kain. Fleet members aren't meant for ground combat. You will get marines and others ground combat members later. And Pluto training mission? I don't recall having such a mission? Pluto is only accessible when Kain becomes a full captain. But I realize now what I goofed up, I was told not to interact with merchant ships on the way so I just ignored the one I was supposed to interact with to continue the story and reached the mining outpost instead of Pluto itself, since I couldn't dock on Pluto at this point. Still a bug. I will put a captain rank restriction on that place in the next patch.